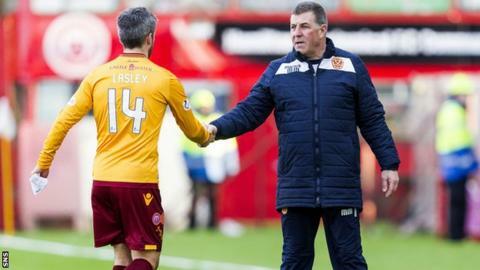 Motherwell boss Mark McGhee admits he feared the sack weeks before going on a winning run that has culminated in a manager of the month award. The Steelmen have won their last five Premiership games to reach fourth place, but in January and February had gone five matches without a victory. "Our form in terms of results in February, in many clubs' eyes, was sack-able," said McGhee. "So I don't take anything for granted. You're only as good as your last game." McGhee was collecting the March prize after Motherwell won all three of their league games last month and that run continued with a last-gasp victory at Inverness on Saturday. "I don't expect any dispensation because I've won a manager of the month," said McGhee, who began his second spell in charge at Fir Park in October. "I need to win next month's to make sure I'm not getting the sack. "When you're losing games you feel under pressure, regardless of who you are. It was no different for me, I knew had to start winning games." Marvin Johnson scored the stoppage-time winner against Caley Thistle and McGhee believes the winger and goalkeeper Conor Ripley deserve a huge amount of credit for their part in the club's recent turn around. "There aren't many better players in this league than Marvin Johnson," he said. "He has everything and I'm astonished he is still here, to be honest. I thought someone would have snapped him away at Christmas." Motherwell can seal a top-six place if other results go their way on Tuesday, while holding on to fourth will offer a Europa League place if Celtic win the double. McGhee, picking up his second award in fourth months having collected the accolade for December's form, did not envisage such a scenario when returning to Fir Park. "I would have thought anyone suggesting we could be pushing for Europe was being ridiculous," he said. "I have only ever thought about finishing above second bottom and the February proved me right because we slipped back again. "It's a target now. Fourth would be a fantastic achievement."